Family and friends cheered loudly as each graduate walked across the stage and shook hands with TCS superintendent Pete Bartkowiak, who gave additional advice. “Remember your accomplishments and use them to go toward your life goals,” he said. SANDUSKY — Each year since 2011, Townsend Community School’s graduating classes have grown in size. On Tuesday, members of its largest class started their futures. More than 250 students from across the area received their diplomas from the Castalia charter school, filling the Sandusky State Theatre’s stage with a few more sitting in seats below. Student speakers Emma Carmichael and Samantha Hill spoke of their journeys to attaining their diplomas and praised the school’s instructors for diligently working with them. “TCS is amazing,” Carmichael added. In second grade, Donald Brooks’ teachers held him back because they thought he wasn’t ready to move on to third grade. But he didn’t lose hope. “Ever since then, I wanted to do everything to the best of my ability so I could graduate with my class,” he said. He enrolled at Townsend last August and was able to earn the credits he needed by this past February. By getting his diploma at Townsend, he’s able to attend a Bible college in Indiana. “I’ll see what God has in store for me,” he said. 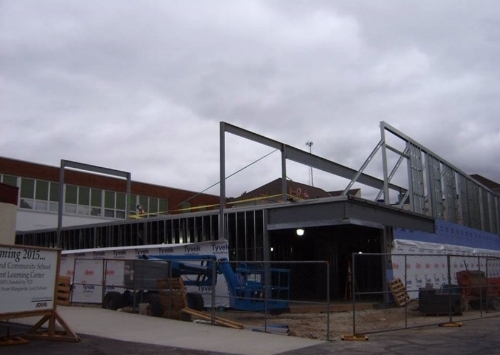 An expansion project expected to nearly double the size of Townsend Community School’s new building is progressing on schedule and on budget, officials say. Aflexible schedule and one-on-one time with teachers first attracted Juleah Palmison to Townsend Community School three years ago. But the fairly new charter school's fresh ideas hardly matched its hand-me-down facilities. Last week, the 17-year-old senior proudly led tours through Townsend Community School's new Student Learning Center, a state-of-the-art facility that debuted this school year. Townsend Community School is ready to showcase its state-of-the-art Student Learning Center to the public.